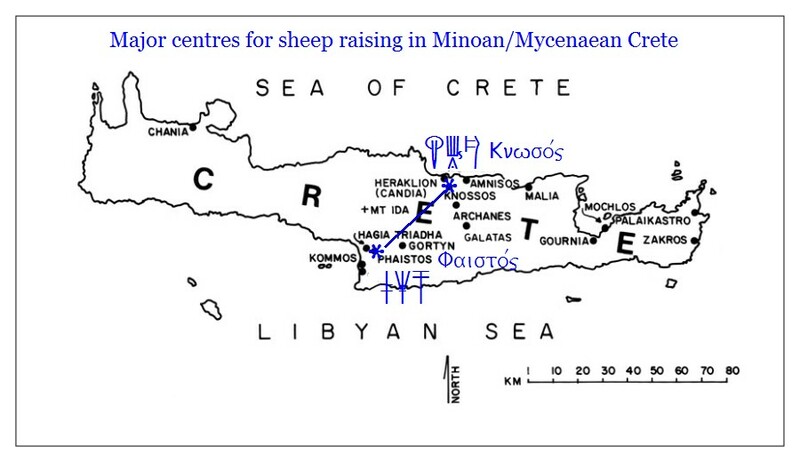 Knossos tablet KN 1280 E m 222 deals with 10 ewes as mothers of 10 lambs, and also with 40 rams in a sheep pen. The supersyllabogram PA = pauro in Linear B or pauros in ancient Greek, also parvus in Latin = “small” or “little”, hence a small sheep is naturally a lamb. As if. 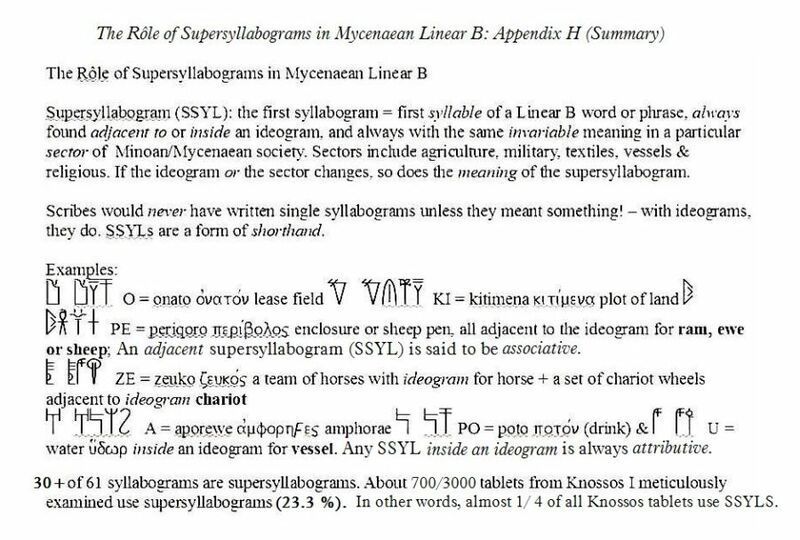 Unfortunately, although the supersyllabogram PA occurs on no less than 38 Linear B tablets in the sheep husbandry sector of the Minoan/Mycenaean economy, there is no attested word corresponding to this supersyllabogram anywhere in the Mycenaean Greek lexicon. So I had to make an “educated guess”. Well, actually more than just educated. After all, the ancient Greek word pauros = Latin parvus = “small” or “little” eminently fits the bill. So I chose it, just like that. It is possible that this SSYL does not mean “lamb”, but I rather doubt it, especially in light of the fact that the number of lambs on this tablet is exactly equal to the number of ewes. 10 mothers, 10 lambs. Knossos Linear B tablet K 919, fleece, penning in sheep on a plot of land etc. 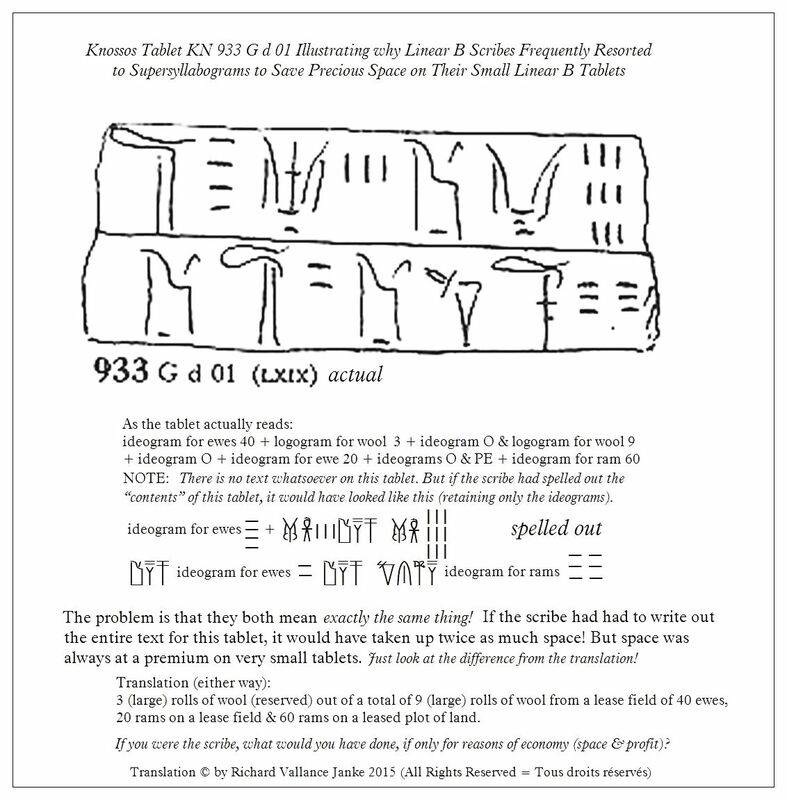 This is a unique Knossos Linear B tablet K 919, the only 1 of its kind in the entire repertoire of Linear B tablets, in so far as in it we have the only appearance in Linear B of the (apparently) independent supersyllabogram SE = sekaze in Linear B or sekazein in ancient Greek, which means “to pen in”. This suits the context like a glove, since the supersyllabogram PE, which means “a sheep pen” pops up immediately after the SSYL KI = “a plot of land”, while the left-truncated O to the right of the tablet is almost certainly the first supersyllabogram,  i.e. O, the first vowel of the Linear B word onaton = “a lease field”. I say that the SSYL SE is apparently independent, since it is not immediately fused with an ideogram,  in this case, the ideogram for “ewes” (100 of them) to its right. But this may be deceptive. The SSYL SE may be partially independent and partially dependent, since (a) it stands on its own in between maro = “fleece” and the ideogram for “ewes”, yet (b) it may very well be dependent on the ideogram for “ewes”, in spite of its placement. 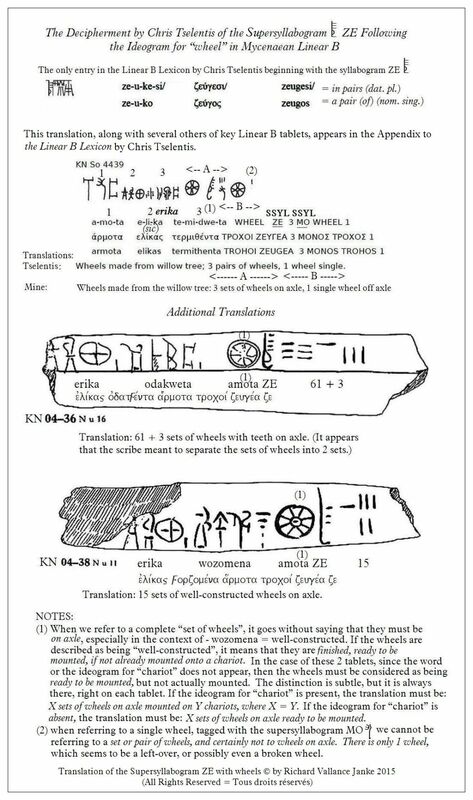 This is also a unique phenomenon in Linear B. No other supersyllabogram other than SE is both dependent and independent, if indeed that is what this one is. I cannot be sure. 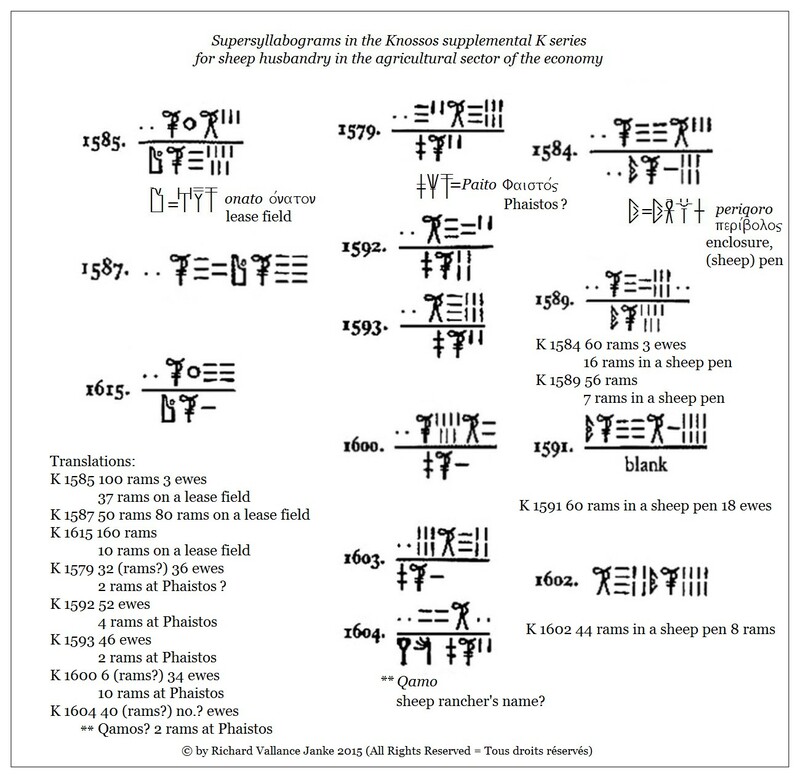 In point of fact, no other scribe ever resorted to placing a supersyllabogram mid-way between a Linear B word, maro, and an ideogram (ewes). Very odd.